$500 discount if booked by May 15th!! We are getting this home ready for the 2019 Summer Season! This recently updated Cape Cod home will be comfortable for you and your extended family. This home offers spacious common areas for those family gatherings, while the 5 floors of space provide privacy too. It is a short 10 minute walk into the beautiful downtown district. We have been renting our homes on the Cape to families since 2011, and this has become our most recent addition. We take great pride at ensuring your family’s stay is most enjoyable. Renter Feedback from our other property can be found by visiting the link at the bottom. This home has many appealing amenities that will be difficult to match for similar 10 to 12 person rentals in this price range. The home is spacious and provides privacy for everyone, while offering large common areas with comfortable seating for the entire family to relax & enjoy. By May 15th, the home will be updated with more than $40,000 of new furniture—beds, leather sofas, eating areas, and new kitchen appliances. Save this home to your favorites as new pictures of the two bedrooms will be posted by before May 15th. Why Does This Vacation Rental Stand-Out from others? The following amenities are often not found with similar rentals at this price: 1) A large dining room table that seats 10 comfortably. 2) A festive outdoor patio that accommodates 10. 3) A large leather sectional sofa (16 foot horseshoe) that seats 10, and large televisions you will not find in a typical rental property. 4) A quiet and comfortable reading room that includes nearly 100 Cape Cod titled books that offer great insight on the local towns, restaurants, hiking trails, beaches, history, and other must-do activities when vacationing on Cape Cod. 5) Four bedrooms that are equipped with their own independent air conditioning system, which allows you to control a temperature that is right for you. 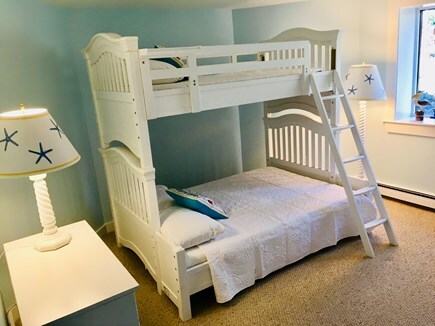 6) A top floor (accessed via spiral staircase) that features a game room and bean bag seating for the kids to enjoy. 7) Lastly, and probably most important, is the ability for the entire family to shower quickly and get ready for dinner after a day at the beach. It can often take hours for 10 people to shower at once given the limited number of showers most homes have, or the hot water cannot keep up with such a large demand. This home is equipped with 4 showers (1 outdoor), which receive their hot water from an on-demand tankless hot water system. Your family will never have to worry about running out of hot water as typically the case with a storage tank systems, as found in most Cape properties. The Home Layout is unique and ideal to support your family vacation with friends or relatives: This architecturally unique home has been fully renovated, and equipped with new furniture & bedding, and is very clean, comfortable, and bright with more than 70 windows that let in the sunlight. It offers a very open but private layout, and has been designed with 5 different levels: The first floor includes a bedroom w/full bath, and its’ own private outdoor entrance. The 2nd floor includes 2 bedrooms with a full bath, and a reading room. The patio is also accessed via the reading room on the 2nd floor. The 3rd floor includes a large living room with 25 foot ceiling. It's a great place to gather on rainy nights and is open to the kitchen and dining room. The 4th floor includes the kitchen, dining room and a half bath. A master bedroom with private bath is located off the kitchen. The kitchen can also be accessed via the front door. The 5th floor is accessed via a spiral staircase, and is set-up as a game/TV room for the kids to enjoy. Nearby Attractions: If it’s not in your budget to rent a beachfront home, or within a short walk to a beach, then you’re likely getting in a vehicle and driving there. This home is ideally located for those who are not renting beachfront property. It is 2 miles (~5 minute drive) from the Orleans bay-side beaches (Skaket) and 2.5 miles from the ocean side beaches (Nauset). It is less than a 15 minute drive to the Cape Cod National Seashore, where the top ranked (#6 in 2019) U.S. beach can be found (Coast Guard). Beach gear (chairs, cooler, umbrella) included. The home is a few minute walk to Eldredge Park where the Orleans Cape Cod Baseball Team plays their home games. The Park is also equipped with a children’s playground, as well as tennis courts. Although the location is private, the home is just a short 10 minute stroll (< 1 mile) to Main Street where there are several restaurants, shops and other activities to explore. A short 5-mile ride brings you to downtown Chatham with many shops and restaurants. The central location of this home makes it very convenient to everything Cape Cod has to offer, and will surely provide a fantastic backdrop for your family to create a memorable vacation. Beaches: Approx. 2 miles from Nauset & Skaket Beach; 5 miles to Coast Guard Beach and the National Seashore. Special Offer: $500 discount in the published weekly rental price between now and May 15th.